If you don’t know what the name Divota means, then you’re about to learn why you should stay in these apartments. Divota translated to English means splendor, which refers to the apartment’s appearance and style. To fully understand the beautiful setting Divota apartments are set in you should visit Split’s Veli Varos district, once home of farm workers and fishermen. The old soul of Split is exceptionally preserved in this old neighborhood of the town. The district features many narrow streets with small modest stone houses, symbolizing the Mediterranean lifestyle. Some of these old residences house several beautiful apartments. If you really want to enjoy in something that is beautiful, something that inspires admiration and the beauty that astonishes, you should book your stay in one of these apartments or rooms. Divota consists of several houses with different type of apartments, studious and rooms scattered on different points of Varos district. The distance between them is less than a five minute walk and as you can see on the map above, they are all concentrated very near the Prokurativa (Republic Square). Apartments and rooms are located on four different addresses. For more pictures and availability see Divota apartments on Agoda or Hotels.com! Rooms are located on the first and on the second floor of a traditional Dalmatian house above the reception. It offers standard and superior double rooms with balcony. Superior double room and superior single room are situated on the ground floor, inside of a small traditional shared courtyard. All rooms have a flat-screen cable TV, a minibar and a fridge. The rooms are set in a traditional Dalmatian house on two floors with an access to the shared lounge area and a terrace (available only for the guests staying in this house). View on Google Maps. Kovacica Street N° 20 – Deluxe Studio Apartment, completely renovated double bed apartment with all amenities required for modern life. The best solution to spend your holiday sunbathing on the nearby beach or exploring Diocletian Palace which is just a short walk away. Kovacica street N°27 – Divota apartments studio. This apartment is located in a small Dalmatian house. The bedroom and bathroom are on the ground floor while the kitchen with sitting area is on the first floor. It is fully equipped with all modern amenities that will satisfy all needs. View on Google Maps. Vijugasta street (Winding street) – A stone staircase, typical for Dalmatian towns, leads to this apartment which is located in the attic of the house. Its interior has been transformed into a peaceful, yet modern and luxurious studios. The apartment is few steps from Split center and to all major happenings. It’s protected from city bustle by narrow streets that are winding up to its front door. View on Google Maps. On TripAdvisor, based on 283 visitor reviews, Divota Apartment Hotel has a total score of 4.6/5, and it’s rated as the #2 hotel in Split. It even won a Traveler’s Choice award for one of the top 25 small hotels in Croatia. Based on 33 reviews on Agoda, Divota earned an “Exceptional” score with an average rating of 9.3/10. Reviews on Booking.com place Divota hotel at the “Wonderful” category with 9.4/10 average review score. 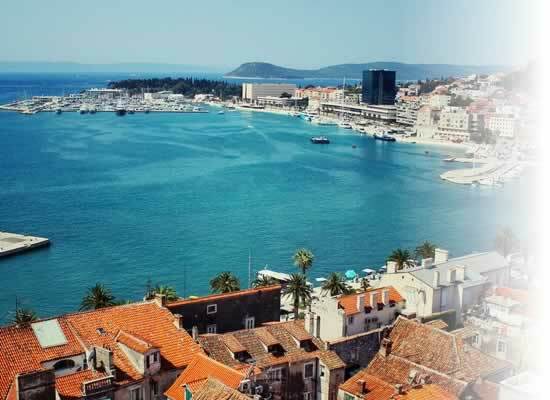 Divota is a small and personal hotel that offers exceptional hospitality and Mediterranean feel, in old Split district just a walk away from popular tourist attractions. Wonderfully designed and with all necessary amenities, this small 4-star hotel/guesthouse will make for a perfect relaxation spot. Alternatively, you can search on HotelsCombined below which will compare prices from different booking websites.